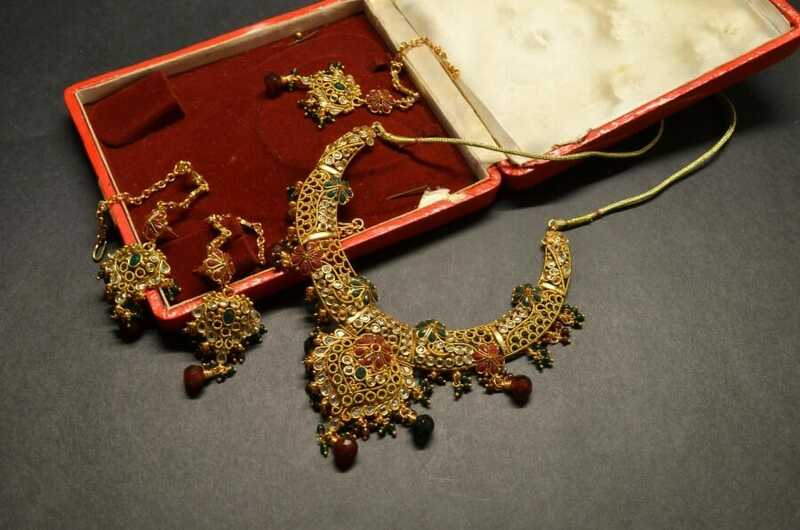 Jewelry in India, most likely to be worn by brides during their weddings. The dovish Federal Reserve outlook on further interest rate hikes has added a new layer of momentum to the bullion market. Gold prices today are exploding – not just surging. Some market analysts believe that growing debt might serve as another external factor to carry gold prices even higher. A report was published by Mike McGlone, a senior Bloomberg strategist, he suggests that gold will rise against an unstoppable climbing government debt. “Gold is set to resume the almost two-decade-long bull market on the back of the increasing U.S budget deficit and peaking dollar,” says the senior strategist. The next milestone for gold will be to test resistance at the price level of $1,350, however prices might falter slightly below, but that is to be expected for rising commodities. This market momentum has carried into the local domestic Indian market as well. Prices of sovereign gold surged by Rs. 200 to Rs. 25,900. The gold rate today in India surged by Rs. 320 to Rs. 34,070, finally crossing the Rs. 34,000 milestone, as the bullion mirrors trends observed overseas. Silver followed suit and increased by Rs. 330 to Rs. 41,330 per one kilogram, this is explainable due to increased local production by coin makers and industrial units. One reason attributed to the success of the precious metals market is the faltering trade relations between the US and China, driven partly by the launch of a criminal investigation of Chinese telecom company, Huawei. The friction between the two countries is seen as a catalyst for gold prices, as investors rush to safe haven assets. Another success story for the precious metals market is palladium, which has emerged as the dominating bullion. It retailed at a price above all other metals after the geopolitical events of 2018. Spot palladium rose by $12.70 to $1,354.60, only slightly above gold. Palladium prices have been pulled up due the metal’s use as an important component of catalysts. Catalytic markets the world over are now pushing for stringent regulations to decrease emissions and improve fuel efficiency, bolstering demand for more capable catalysts. This, coupled with the fact that production and sales of electric vehicles are on the rise, the demand placed on palladium will only continue to increase. This is contrasted by a supply deficit in the market for palladium, which is primarily mined in Russia. Providing support to palladium prices are policy initiatives unveiled by China, the world’s biggest auto maker. There just isn’t enough palladium to meet the high demands required by the automotive industry, which means that interest will largely switch to platinum, a cheaper suitable alternative. But making this switch will take time for engineers, to the tune of at least 18 months. “It isn’t like the flick of a switch for us,” says Rahul Mital, a technical specialist at General Motors, co. And who’s to say that prices won’t reverse once the eventual switch is made. As automakers weigh their options, both platinum and palladium profit investors.